One of those figures, Julian Fellowes, 69, is the Oscar-winning writer (”Gosford Park”) who created the upstairs-downstairs period-drama phenomenon “Downton Abbey.” The other, Andrew Lloyd Webber, 70, is the Tony Award-winning composer responsible for unleashing the power-ballad musical on the masses with blockbusters like “Phantom of the Opera,” “Evita,” and “Cats.” Neither man is exactly the epitome of rock ’n’ roll cool. In the end, Lloyd Webber and Fellowes’s pairing with lyricist Glenn Slater (“Tangled,” the theatrical adaptation of “The Little Mermaid”) and director Laurence Connor appears to have been an inspired choice for adapting the shaggily spirited, idiosyncratic film, written by Mike White and directed by indie auteur Richard Linklater, for the stage. Indeed, the show recently wrapped up a three-year run on Broadway, where it was nominated for four Tony Awards, including best musical and best score. 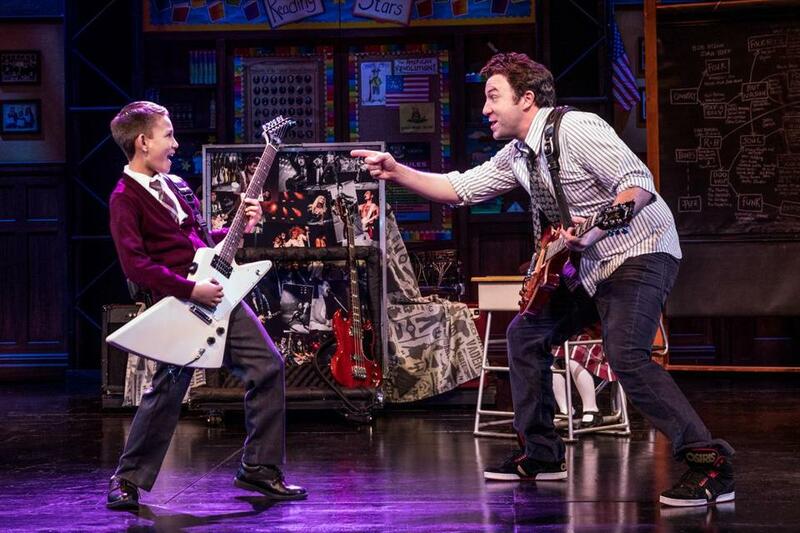 The national tour of “School of Rock: The Musical,” presented by Broadway in Boston, arrives at the Boston Opera House for a run from Feb. 12-24. Madeleine Lloyd Webber, the composer’s wife, was the executive producer of the Broadway show and the initial driving force behind the screen-to-stage adaptation. She agrees the Fellowes-Lloyd Webber partnership may seem unexpected, but points out that her husband did, after all, write one of the earliest rock operas — “Jesus Christ Superstar” — in 1970. “When you look at Andrew, it’s dangerous to pigeonhole him,” she says in a phone interview. The “School of Rock” film was a favorite of Lloyd Webber’s children. The first time her kids made her watch it, she was “crying with laughter.” Halfway through the movie, she realized its potential as a musical. “I thought if we could ever turn real children into musicians in front of your eyes, it would be the most amazing theatrical coup,” she says. In 2006, she reached out to Paramount Pictures, which produced the film and owned the stage rights; it promptly turned her down. Lloyd Webber, remained undaunted. She made a note in her diary to check in with the studio every year; after six years of asking, Paramount finally said yes. “I think they just couldn’t think of any more excuses,” she says. At the center of the story is the dyspeptic Dewey Finn, a schlubby layabout who has been kicked out of his own band. In desperate need of money to pay the rent, Dewey passes himself off as a substitute teacher at a prestigious prep school, where he proceeds to fall asleep, grumble about being hungover, and ignore his charges most of the day. But when he realizes these overachieving fifth-graders have real musical talent, he gets busy transforming them into guitar-shredding, song-belting rock stars, while secretly preparing them to perform in a Battle of the Bands. Along the way, sparks fly between him and the school’s tightly-wound principal, Rosalie Mullins. The kids include the outspoken Summer, who first clashes with Dewey but later becomes the band’s manager; smart-aleck guitarist Zack, who struggles in school but may have found his calling in songwriting; new kid Tomika, whose shyness belies an incredible set of pipes; and stoic keyboardist Lawrence, who worries he’s not cool enough to be in a band. Christopher Wallenberg can be reached at chriswallenberg@gmail.com.